The Spring Split of the LCS Season 8 has already begun and marks the beginning of a year full of LoL tournaments and competitions. While the individual regions are looking for the best team in their own league in the first three months of the year, the LCS Spring Split 2018 playoffs will end just before the first international tournament of the year. The winners of the regional splits compete against each other at the Mid-Season Invitational 2018 and promise almost a month of thrilling matches. For the first time ever, the MSI will be held in Europe. Surprisingly enough, last year's European team G2 Esports made it to the finals and lost 3-1 to SK Telecom T1, making the latter the winner of the tournament. Due to the current situation in EU LCS and LCK (South Korea) it is possible that neither of these teams will qualify for the MSI 2018. In Korea, reigning World Champion KSV eSport (formerly known as Samsung Galaxy), is the big favourite for the Spring Split title. In Europe and North America everything is still possible and almost every team could participate at the Mid-Season Invitational. The playoffs in Europe were on April 8th, 2018, and the MSI 2018 will take place from May 3rd to May 20th. Riot has not yet announced any major changes to the format of the tournament, so it can be assumed that a Play-In Stage will take place first, where the teams of the former Wildcard regions will play against each other directly before the main event starts. It has been revealed that the tournament will take place in Berlin and Paris. The results of the MSI 2018 will also, most likely, affect the number of seeds per region for the LoL World Championship 2018. We will keep you up to date and as soon as we have more information. You will find it here. This year, the most important change at the international competitive level, is that Vietnam stopped being a wildcard region and became an independent region on the competitive scene, which means that it will have a place in the MSI 2018 and will become an event of 14 regions fighting for the title of tournament champion. The event will have several stages, play-in stage: round 1 and round 2, after which the main event will begin where it will also have a group phase and the tournament playoffs. In the group phase of this stage there will be 8 participating teams from the wildcard regions, where they will be divided into two groups in a double round robin, where the best team from each group will advance to the playoffs of this phase. The games will be played to the best of 1, except for the playoffs where they will be to the best of 5; the best team from each group will face the representatives of the VCS and the LMS. The winning Play-In teams will advance to the main event where they will join the NA LCS, EU LCS, LCK and LPL representative teams. At this stage, the six teams will face each other in a double round robin. The top 4 teams of this phase will advance to the playoffs where 1st place in the standings can choose whether to face 3rd or 4th place, which would give them an advantage. Round 1: there will be 8 teams participating in this round and they will be divided into two groups, the format of this round will be a double round robin at best of 1, the winner of each group will advance to round 2, the participants of this round are the teams from the regions: Brazil (CBLOL), Southeast Asia (GPL), Commonwealth of Independent States (CIS), Turkey (TCL), Japan (LJL), South Latin America (CLS), North Latin America (LLN), Oceania (OPL). Here you can see a table with the current tournament positions and will be updated live. They'll advance to round two. They are eliminated from the tournament. Round 2: Teams that get first place in their respective groups will advance to round 2, where they will be paired up and face off randomly against teams representing the Vietnam (VCS) and Taiwan/Hong Kong/Macao (LMS) regions in a best of 5 match. The team that wins in this round can participate in the main event of MSI 2018. Group Stage: will have 4 teams qualified directly based on their performance in the last two years, both at LoL Worlds and the Mid-Season Invitational, of course, the Worlds will have more weight than the MSI, these teams are the regional representatives of North America (NA LCS), Europe (EU LCS), Korea (LCK), China (LPL) and the winners of Round 2 of the Play-In Stage. The format of this phase will be a double round robin at best of 1. Playoffs: Here, the top 4 teams in the group stage will advance to the MSI 2018 playoffs, where 1st place in the standings can decide whether to face 3rd or 4th place, which will give them a considerable advantage in terms of meta, champion selections and bans. The 2nd place qualifier will play with the other team. The victorious teams will face off in the grand final, where the winner will win the title of Mid-Season Invitational 2018 champion. The format of the qualifiers will be the best of 5. All major bookmakers will have League of Legends betting odds for the Mid-Season Invitational 2018. As soon as all the teams have qualified, there will be odds not only for the games in the opening phase, but also for the tournament champion and many other options. We will keep you informed with all the news related to the Mid-Season Invitational 2018 as well as available promotions. 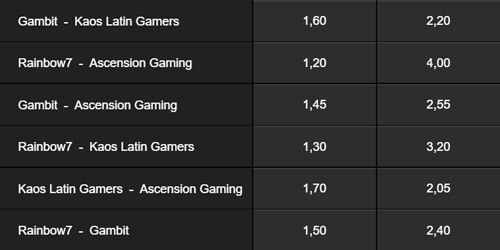 You can see the first betting odds for MSI 2018 here. In the previous year, the prize pool reached a total of $1,690,000, with one million dollars coming from Riot itself. This year the fans can contribute to the prize money again, in time for the tournament new skins and icons will be released, the earnings of which will directly support the whole tournament and your favourite team. All MSI 2018 games will be broadcast in several languages. Details about the live-streaming and their schedules will be available here as soon as possible, and you can see them on this page.